Sorting a Stack using push,pop,isEmpty and peek. A similar question was solver in previous post about how to reverse a Stack in Java. It has similar logic. Program to reverse a stack "in place" using recursion? Counting sort is a sorting technique based on keys between a specific range. It works by counting the number of objects having distinct key values (kind of hashing). Then doing some arithmetic to calculate the position of each object in the output sequence. NOTE : The modified count array indicates the position of each object in the output sequence. Time Complexity: O(n+k) where n is the number of elements in input array and k is the range of input. The most unbalanced partition occurs when one of the sublists returned by the partitioning routine is of size n − 1. This may occur if the pivot happens to be the smallest or largest element in the list, or in some implementations when all the elements are equal. If this happens repeatedly in every partition, then each recursive call processes a list of size one less than the previous list. Consequently, we can make n − 1 nested calls before we reach a list of size 1. 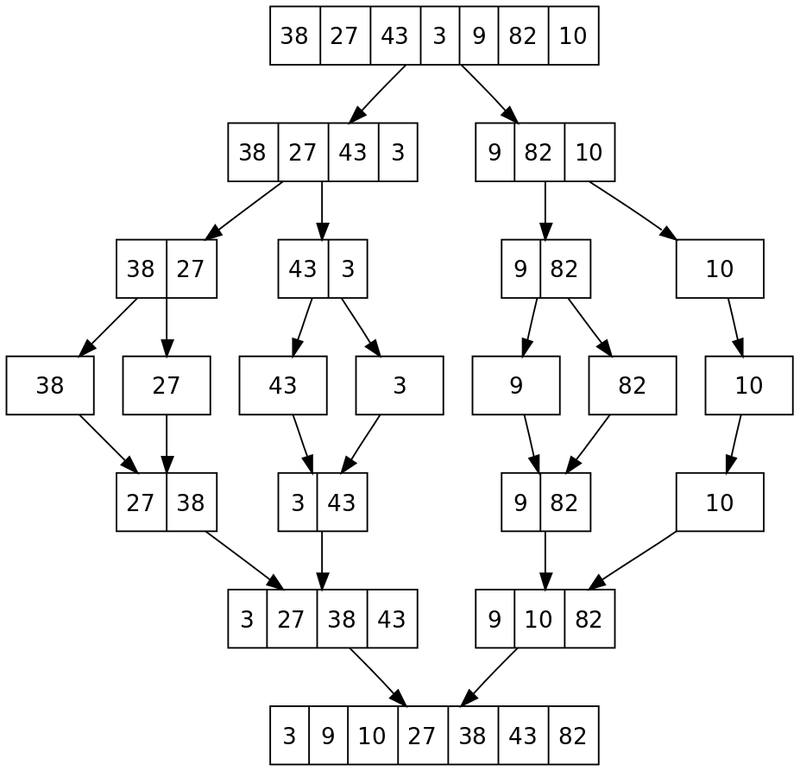 This means that the call tree is a linear chain of n − 1 nested calls. The ith call does O(n − i) work to do the partition, and , so in that case, Quicksort takes O(n²) time. As of Perl 5.8, merge sort is its default sorting algorithm (it was quicksort in previous versions of Perl). In Java, the Arrays.sort() methods use merge sort or a tuned quicksort depending on the datatypes and for implementation efficiency switch to insertion sort when fewer than seven array elements are being sorted. Python uses Timsort, another tuned hybrid of merge sort and insertion sort, that has become the standard sort algorithm in Java SE & on the Android platform, and in GNU Octave. Mergesort is a divide and conquer algorithm that was invented by John von Neumann in 1945. Divide the unsorted list into n sublists, each containing 1 element (a list of 1 element is considered sorted). Repeatedly merge sublists to produce newly sorted sublists until there is only 1 sublist remaining. This will be the sorted list. In sorting n objects, merge sort has an average and worst-case performance of O(n log n). Sort chunks that each fit in RAM, then merges the sorted chunks together. First divide the file into runs such that the size of a run is small enough to fit into main memory. 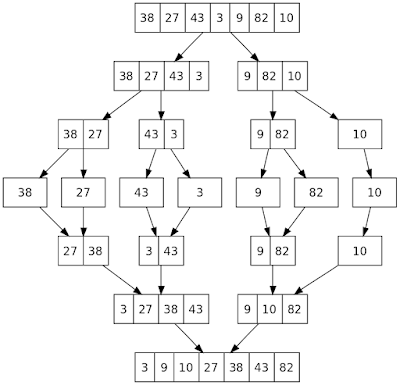 Then sort each run in main memory using merge sort sorting algorithm. Finally merge the resulting runs together into successively bigger runs, until the file is sorted. Read 100 MB of the data in main memory and sort by some conventional method, like quicksort. Write the sorted data to disk. Repeat steps 1 and 2 until all of the data is in sorted 100 MB chunks (there are 900MB / 100MB = 9 chunks), which now need to be merged into one single output file. Perform a 9-way merge and store the result in the output buffer. Whenever the output buffer fills, write it to the final sorted file and empty it. Whenever any of the 9 input buffers empties, fill it with the next 10 MB of its associated 100 MB sorted chunk until no more data from the chunk is available. This is the key step that makes external merge sort work externally -- because the merge algorithm only makes one pass sequentially through each of the chunks, each chunk does not have to be loaded completely; rather, sequential parts of the chunk can be loaded as needed. At any iteration i, elements 0 to i-1 will be sorted and with each increment in i previous list of sorted elements will grow. Worst case complexity is O(N2) like bubble sort. However the best case is O(N) - already sorted array. Both bubble sort and insertion sort are not suitable for sorting large numbers. In bubble sort the largest elements goes to the end of the array and the remaining array (0 - array.length-i) is sorted again. It's like a bubble where on each iteration largest element goes to the end. Bubble sort has worst-case and average complexity both O(n2), where n is the number of items being sorted. As we know that bubble sort runs in O(N^2) time complexity. If this question is asked(mostly in the 1st round to make sure you know basic sorting algorithms) then it will mostly be followed by a counter question. How can you optimize bubble sort ? If you notice we iterate over all the indexes and for each outer iteration we bubble out the largest number to the end. Now if at some index the array is completely sorted we need to proceed iterating on further indexes. That is precisely what we are going to do. Keep a boolean flag denoting if array is completely sorted or not. At the outer loop initialize it to true and make it false if any iteration of inner for loop happens denoting array is not completely sorted yet. When inner loop does not execute it means array is completely sorted and there is no need to proceed. In this case flag will be true which we initialized in outer loop. If such condition happens i.e if flag is true than break from the loops and print the sorted array. * Created by Aniket on 2/19/14. NOTE : Swapper.inMemorySwap in a normal swap function where data at two indexes are swapper. You can choose to use a temporary variable or not (see swapping of variables in related links section).